It all started with my bad habit of opening too many tabs and leaving them open. I had been booking my flights back to Tassie and decided to have a look at AirAsia (I went with MAS in the end). Me being me, the AirAsia tab remained open on my browser until I stumbled across it again days later while looking for another tab. Lo and behold, right on the homepage: AirAsia sales! 'Sale' being my favourite four-letter word after 'food' and 'love', I hotfooted it over to have a look. I scrolled past the pricier overseas flights, and it wasn't long before I settled on Langkawi. Too far away from PJ to drive? Check. Somewhere I'd never been before? Check. Beach? Check. Shopping? Definitely check. One of my duty-free purchases. Super cute! I was ecstatic to discover that the cheapest flights were only RM29 (one-way, before all those extra charges). Then I had a look at the sales period and freaked out when I realised that it was the final day -- it was Meant to Be! Immediately, I contacted the two people I wanted to go on an island holiday with: Sze Li and Timothy. They both said yes, I did a little dance, and we bought three return tickets costing a little under RM300 (this included 15kg of check-in luggage for one person on the way back)(you know, for shopping). What a bargain! It was up to me to plan the holiday, since Sze Li and Timothy were both still having classes and assignments and exams and such. After much research on TripAdvisor, I booked us a room at the cheapest, non-dodgy-looking place in Pantai Cenang I could find: Sweet Inn Motel. It was RM80 a night instead of the usual ~RM100, it being off-peak season in January. Then I forgot all about it till a few days before, which was when I researched places to see and places to eat ('food' before 'sale', remember?). The Internet really is amazing. How in the world did people plan holidays before it? Google Maps was a great help because it allowed me to visualise the attractions we were headed to. From there, I could scout out good makan places around the area as well as plan a rough itinerary. Planning was good because it got me excited for the trip! We ended up only going to like a third of these places. On the 12th, the three of us took the Skybus from KL Sentral to LCCT (RM10). That and the flight were rather uneventful, other than us not knowing which gate to go to because our flight wasn't displayed on the screen that wasn't blank. Grr, LCCT. It's a good thing you're fairly small. Oh, it was Sze Li's first time on a plane, so it was nice seeing her so excited! We touched down in Langkawi in the late evening, and got a taxi from the airport to our hotel (RM20). The roads were long and wonderfully empty, and we managed to catch a bit of the sunset as we zoomed along. We drove past a paddy field and little food stalls by the side of the road and people sitting on the curb to watch the sunset, and it felt very Malaysian, but not the Malaysia I was used to. The vibe was much different from that in KL or even PJ. I wondered if this was a kampung thing or just the whole island vibe thing. To get to our hotel, we drove down Jalan Pantai Cenang and took this little turn-off. There was a whole cluster of small hotels, inns, and dorms there, and you had to wonder about competition. Then again, they were all pretty small; on the day we left, Sweet Inn actually posted up a makeshift sign (it was really a sheet of A4 paper) declaring that they were full. Anyway, we checked in, dumped our stuff in our room, and walked out in search of Nasi Kandar Tomato for dinner. This took longer than expected due to being misled by the guy at reception. We got our nasi kandar in the end, which was good and cheap, and then took the little lane beside the building to get to the beach. 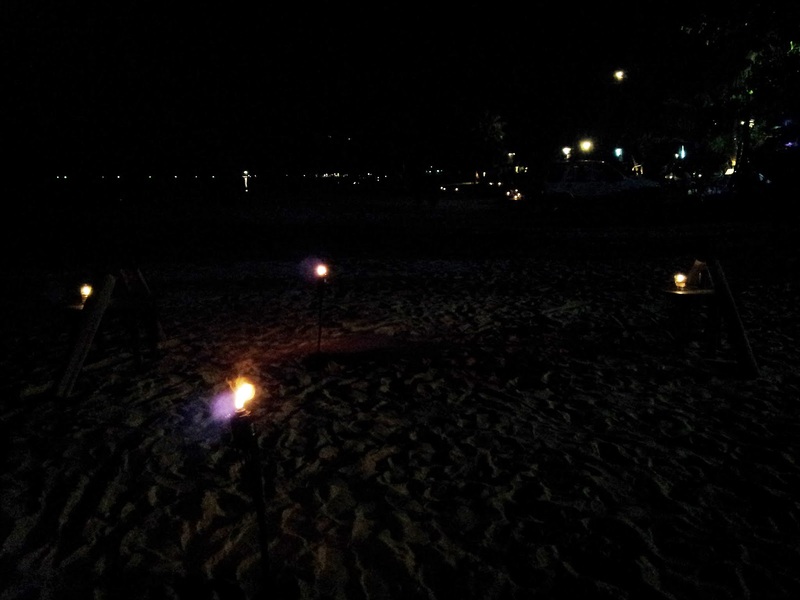 They're actually cups of kerosene with lit candles floating in them, on tables, surrounded by straw mats. The place was called Chiang Mai Cocktail Bar, named such, the owner told us, because he himself was from Chiang Mai. Cocktails were all RM10 each, but if you paid RM15 or RM20, you could get them stronger or even stronger. The owner recommended a Siam Special, which I got. It was good! I can't remember what was in it, but I think there was vodka, and the plastic cup came with a wedge of pineapple perched on its rim. The three of us sipped our drinks while sprawled out on a straw mat each. It was blissful. Once we were done there, we found Little Lylia's and went in. 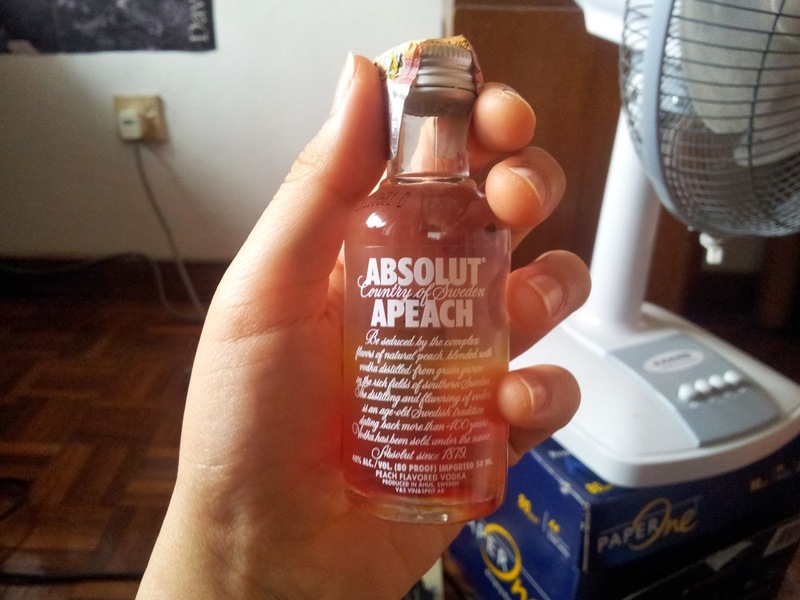 Their Wild Night Out sounded incredibly potent and cost RM16, so I instead opted for the Langkawi Sunset, RM12. What the latter was was really just red wine, mango juice, and ice. Mostly mango juice and ice. Red wine and mango juice was a surprisingly good combination, though! It looked rather nice too, with the layer of red wine sitting pretty atop the orange-coloured mango juice. 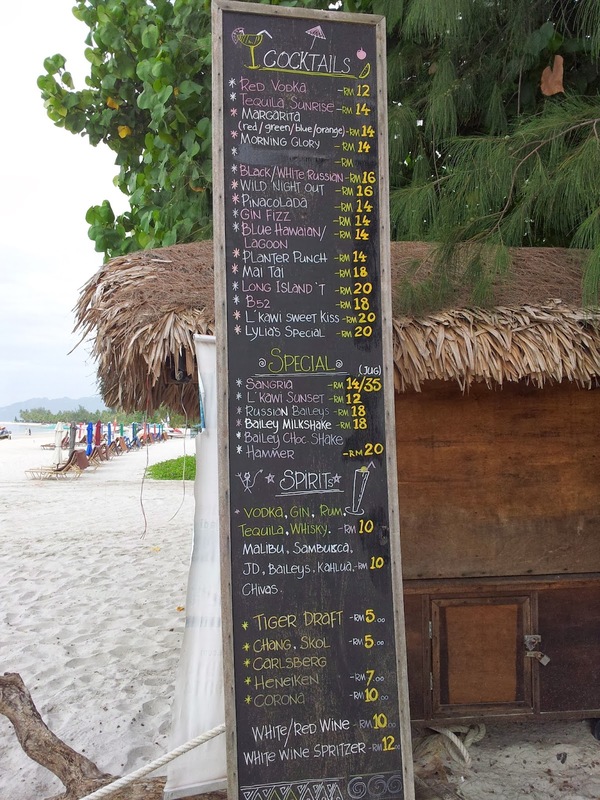 Took a pic of the drinks menu at Little Lylia's the next morning. Little Lylia's was interesting because there was live music, and also because there was a large bunch of Swedes occupying the central table closest to the stage. One of them in particular, a guy I would hazard a guess to be in his thirties, was rather drunk and started dancing with one of the pillars. He then proceeded to get atop the table to dance some more and remove his shirt. Soon, he was joined by a cute, younger guy whom we'd pegged as gay due to his yellow shorts and excessive touching when conversing with guys. They weren't all loud and boisterous, though -- a girl from their table got up to perform with her ukulele, and she had a sweet, lovely voice. Anyway, it was all very entertaining, and it reminded me of how much I like people-watching. We left after they did, walking back to our hotel. We got cleaned up and then went to bed though it was fairly early, wanting to start our first proper day in Langkawi fresh and well-rested.